The Volkspolizei "People's Police" or VP, was the national police force of the German Democratic Republic (East Germany). 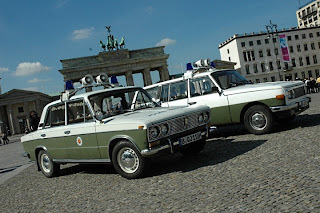 The Volkspolizei were responsible for most law enforcement in East Germany, but its organisation and structure were such that it could be considered a paramilitary force as well. Unlike typical police in most countries, they were equipped with armored personnel carriers and artillery pieces and trained along the same lines as military units. While any East German citizen could be a non-commissioned officer, all members of the commissioned officer corps were required to be members of the Socialist Unity Party of Germany (SED), as the force was expected to maintain the interests of the party and its regime as well as public order. The VP was founded after World War II, taking the East German remnant of the Nazi Ordnungspolizei (Orpo) and Kriminalpolizei (Kripo), and was abolished after German reunification. East Germans nicknamed the Volkspolizei the VoPo. The Volkspolizei was effectively founded just following World War II, when the Soviet Union established central police forces in the regions of Germany it occupied (in violation of the agreements at the Yalta Conference and the Potsdam Conference). The SVAG approved the arming of community-level police forces on 31 October 1945. The Volkspolizei executed traditional police duties such as investigation and traffic control. The VP transferred most of their reports to the Ministry of State Security (MfS) or 'Stasi' and the high density of MfS informants in the GDR, especially in the forces, meant that every police action and investigation could be monitored as besides the official MfS liaison-officer (VO-Verbindungsoffizier), the MfS had agents in nearly every police unit. The Volkspolizei was a national police force and was directly administered by and subordinate only to the Ministry of the Interior. Rather than the civil service status that West German police enjoyed, each Volkspolizist had a personal contract with the government. The monthly salary was above the average income. The military part of the Volkspolizei, that is the Kasernierte Einheiten, was administered by the Deputy Minister of the Interior and Chief of the Administrative Center (Stellvertreter des Minister und Chef der Hauptinspektion). Recruitment to the Volkspolizei required at least ten years of education, vocational training (see education in East Germany), military service, and a history of political loyalty. Upon joining, a recruit would take a five-month course at the Police Academy (VP-Schule). The schedule contained political education, police law, criminal law and procedures, and military-style fitness training. Afterwards the recruit completed a 6-month practical internship. The reasons Volkspolizei officers gave for joining the force were a desire to work with people, idealism, family tradition, belief in the system and the wish to serve one's country. From 1962, the DVP had its own school in Berlin-Biesdorf which trained around 3,500 officers up to 1989. There were several other schools. The Kasernierten Einheiten (barracks units) had their own training facilities. Officers were initially trained in the army ground forces, from 1963 at the Officers' school and from 1971 to the officers' school in Dresden-Wilder Mann. The Volkspolizei had approximately 80,000 full-time police officers and 177,500 volunteers. With the accession of the GDR to the Federal Republic on 3 October 1990, authority over the police went to the newly created federal jurisdiction. About 40 percent of the DVP employees had to leave the service. The National People's Army and the Volkspolizei erected the Berlin Wall in 1961. The leadership declared it would protect the country against what they represented as the negative elements of West German and NATO societies, particularly fascist sympathisers (the wall was officially called the "anti-fascist protection rampart") and help on the way to a crime-free workers' state. Ich schwöre meinem sozialistischen Vaterland, der Deutschen Demokratischen Republik und ihrer Regierung allzeit treu ergeben zu sein, Dienst- und Staatsgeheimnisse zu wahren und die Gesetze und Weisungen genau einzuhalten. Ich werde unentwegt danach streben, gewissenhaft, ehrlich, mutig, diszipliniert und wachsam meine Dienstpflichten zu erfüllen. daß ich, ohne meine Kräfte zu schonen, auch unter Einsatz meines Lebens, die sozialistische Gesellschafts-, Staats- und Rechtsordnung, das sozialistische Eigentum, die Persönlichkeit, die Rechte und das persönliche Eigentum der Bürger vor verbrecherischen Anschlägen schützen werde. Sollte ich dennoch diesen meinen feierlichen Eid brechen, so möge mich die Strafe der Gesetze unserer Republik treffen. I swear, to be loyal to my socialist fatherland, the German Democratic Republic and its government at all times, to keep official and state secrets, and to strictly obey laws and instructions. I will unswervingly strive to fulfill my official duties conscientiously, honestly, courageously, vigilantly and with discipline. 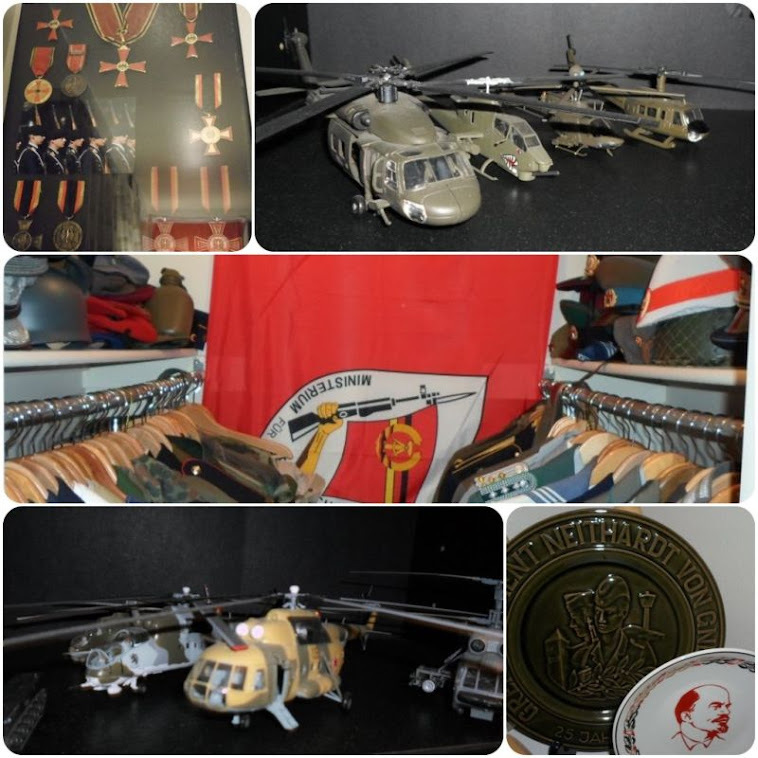 that I will, without reservation, under risk of my life protect the socialist social, state and legal order, the socialist property, the personality, the rights and the personal property of the citizens against felonious attacks. If I nevertheless break this, my solemn oath, I shall be confronted with the punishment of the laws of our republic. With the exception of the Kasernierte Volkspolizei, whose stone-grey uniforms follow the style of the East German National People’s Army (Nationale Volksarmee - NVA), all Volkspolizei services wore the same basic uniform adopted in 1956 when it was officially established. There were various kinds of uniforms, worn according to the work or social situation and differing in material for summer or winter wear. Most uniforms including service, semi-dress, and parade were gray-green but the Transportpolizei (Transport Police) wore dark blue. The better quality and texture of the cloth in officers' uniforms distinguished them from the uniforms of enlisted personnel. The field and service uniforms became normal attire in garrison and for most other duty activities. The basic categories of uniforms were field, service, semi-dress, and parade. Field uniforms (Felddienstuniform) were for only the Kasernierte Volkspolizei. The field uniform consisted of the NVA's service uniform. The uniform was worn with a field cap, service cap, or steel helmet; high black boots; and a leather belt with vertical web shoulder suspenders. In the winter, a quilted stone-grey padded suit without a camouflage pattern is worn over the service uniform. The winter uniform also includes a fur pile cap or a steel helmet, boots, knitted grey gloves, belt, and suspenders. The service uniform (Dienstuniform) was a summer service uniform for officers with a bloused jacket, worn without a shirt, trousers, and a visored service cap. The winter service uniform featured a jacket had four large patch pockets with button-down tabs, worn with a black belt, the service cap, breeches, shirt, tie, belt, and high boots are provided for officers and NCOs. For winter, there also is a long, heavy, belted overcoat. The semi-dress uniform (Ausgangsuniform), except in details, was the same for all ranks and was worn on off-duty or off-post occasions. It included the service cap, jacket, long trousers, and black low-quarter shoes. The single-breasted jacket was worn without a belt, with a white or grey-green shirt and a green tie. Officers were allowed to wear the jacket with a white shirt. During periods of warm summer weather, either the shirt and tie or the jacket may be omitted. For a while a double-breasted jacket could be worn as optional wear by officers and warrant officers. The parade uniform (Paradeuniform) for officers was the semi-dress jacket worn with all awards and decorations, breeches and riding boots, steel helmet or police shako (Tschako) from 1950 to the late 1960s, white shirt, green neck-tie, and a ceremonial dagger on the left side, fastened to a silver-grey parade belt. Officers in guards of honour carry sabres. In winter, overcoat, scarf, and gloves were worn. The type of work uniform (Arbeitsuniform) worn was governed by seasonal considerations and weather. Generally, reconditioned items of service clothing; field, semi-dress and winter padded uniforms; some dyed black, were issued for all types of fatigue and maintenance details. Coveralls are also used by the lower ranks, especially heavy vehicle and flying personnel. Officers in technical branches supervising fatigue details wear a laboratory-style smock. Other types of Volkspolizei uniforms existed. High-ranking officers occasionally wore white uniforms, or at least a white jacket, and staff officers were supplied with staff service uniforms. Women had their own uniforms consisting of jackets, skirts or slacks, blouses, caps, boots or pumps, and other appropriate items in accordance with the season and the occasion. Traffic police, motorcyclists, armoured vehicle personnel, and others have special items of apparel. Volkspolizei uniform initially had green waffenfarben, but later reverted to white except for the transport police who wore blue. The uniform of the Kasernierte Volkspolizei is distinguished from that of the NVA Ground Force and Air Defense Force by a green armband with large silver letters identifying the wearer's affiliation. In October 1948 the Soviet Military Administration in Germany formed the Alert Police (Bereitschaftspolizei), a force of armed units housed in barracks and trained in military fashion. The force consisted of forty units with 100 - 250 men each, the units were subordinated to provincial authorities. Many of the officers and men were recruited among German POWs held in the Soviet Union. In November 1948 the German Interior Administration (Deutschen Verwaltung des Innern, DVdI) took responsibility over the force (and the border troops) and included them in section named Hauptabteilung Grenzpolizei und Bereitschaften (HA GP/B). The section was renamed to Verwaltung für Schulung (VfS) on August 25, 1949, to Hauptverwaltung für Ausbildung (HVA) on October 15, 1949 and to Kasernierte Volkspolizei (KVP) on June 1, 1952. In addition to ground troops HVA and KVP also included a separate naval and air arm. In December 1952 KVP membership was up to 90,250. The communist party and Soviet military authorities exercised strict ideological control over the force. On March 1, 1956 the KVP units were transferred into the newly established army of East Germany, the National People's Army (NVA). The East German Ministry of the Interior maintained, since 1960, an independent Department of the Alert Units of the Volkspolizei known as the Volkspolizei-Bereitschaften (VPB). It consisted of between 12,000 and 15,000 men in 21 Volkspolizei Alert Units of battalion strength. There was usually one unit per district of East Germany but the key districts of Halle, Leipzig and Magdeburg, with their large working class populations, and Potsdam all had two units. The Presidium of the People's Police in East Berlin had three units located in Basdorf. These units were equipped with light and medium infantry weapons, SK-1 wheeled armored personnel carriers, SK-2 water cannon (both armored and unarmored versions) and buses. Their uniform was the standard Volkspolizei grey-green. The political reliability of the Alert Units was of particular importance to the Socialist Unity Party of Germany (SED) as they would be used against the population in the event of social disorders such as the popular uprisings of 17 June 1953 in the industrial areas of East Germany.